Ladies & Gentlemen I would like to introduce to you the designer behind The Luna Tree logo’s and graphics you see here and on my Etsy shop. Allie Bandy. I met Allie through the Indie Business class that I was participating in on line. She was also a student, who turns out is a great graphic designer as well. 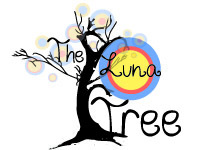 Without ever having met in person, she managed to capture the whimsical idea I was looking to convey in the logo and buttons for The Luna Tree. I sent her a couple of pictures as jumping off points and she ran with it from there. We collaborated through email over the course of a few weeks and in the end came up with what I think is a fantastic design. She is just getting started with her business, so please if you are in need of a graphic designer, definitely check her out. You can visit her blog at http://alexandraraedesign.blogspot.com/ or view her portfolio site http://www.alexandrabandy.com/. If you would like to contact her, email Allie Bandy at “abandgeek88@gmail.com” or follow her on twitter @abandy. Thank you again Allie. You did an outstanding job. Yay Indie Biz networking! Great work, guys!